Hello amazing friends! 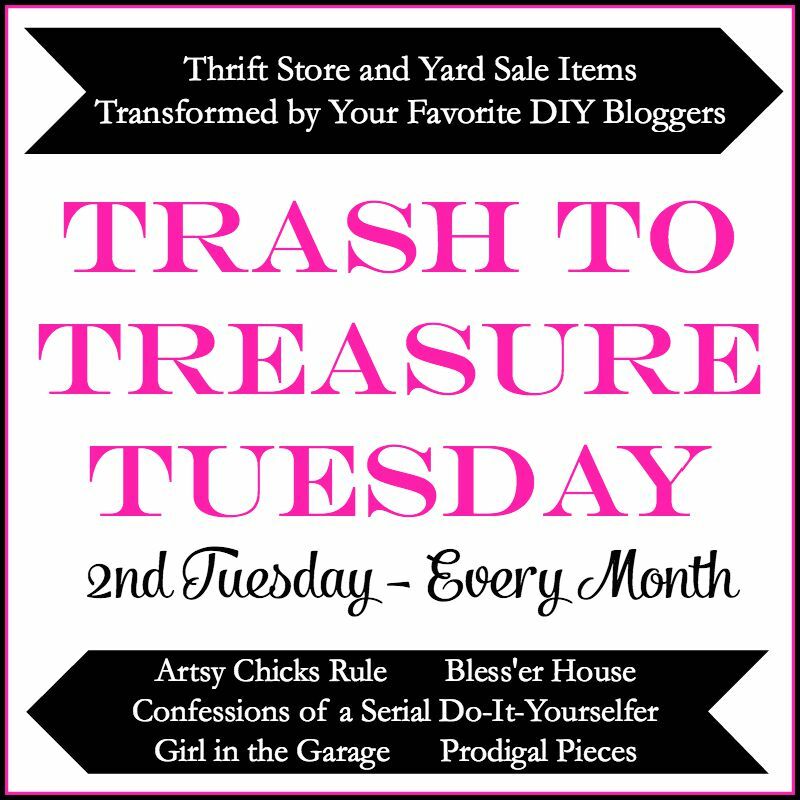 It’s Trash-to-Treasure Tuesday and I am so excited to share a makeover with ya’ll today! No I didn’t stop the presses here amidst the new house chaos to update a piece of furniture, I planned ahead for this one. He ended up getting it for $20. Then all of a sudden we found THE house. I told Jack he needed to get working on his desk asap so we could get it out of the garage because we would need to start packing very soon. He finished for the day and pulled the desk inside the garage. It poured rain that night and guess what got left outside? 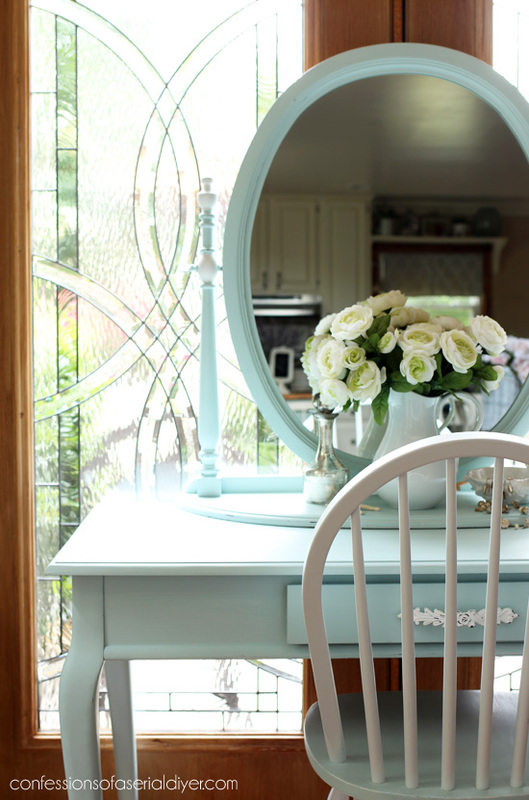 I knew that desk was just what this mirror was waiting for, and it got me excited about painting it to go with the desk to make it a dressing table! 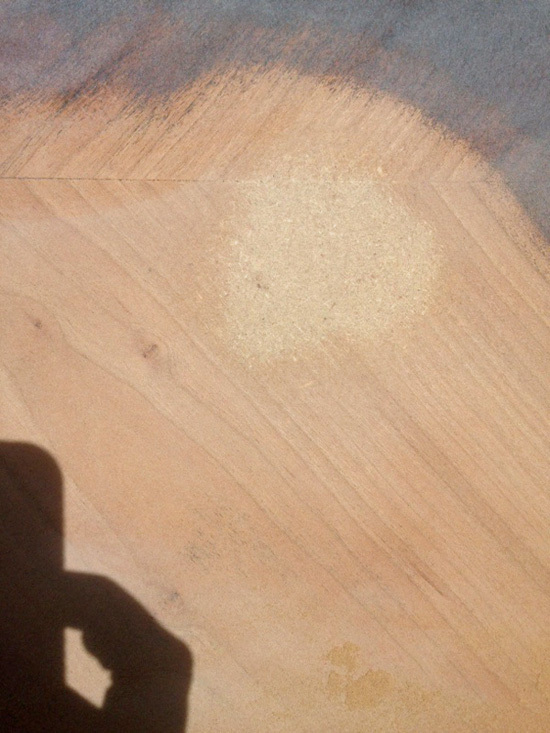 I called Jack and offered to pay him twice what he paid for the desk if he would be willing to let me finish it. He loved that idea since the desk had turned out to be a bit more trouble than he had anticipated. 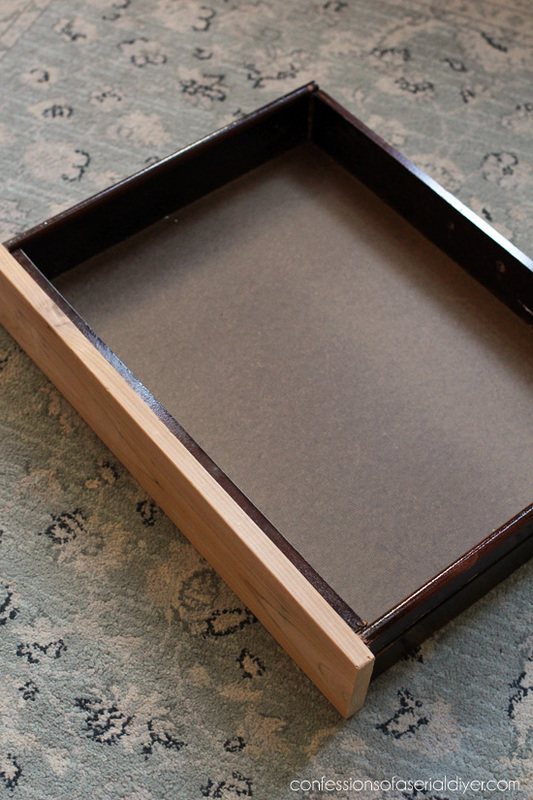 And how about that pretty drawer? 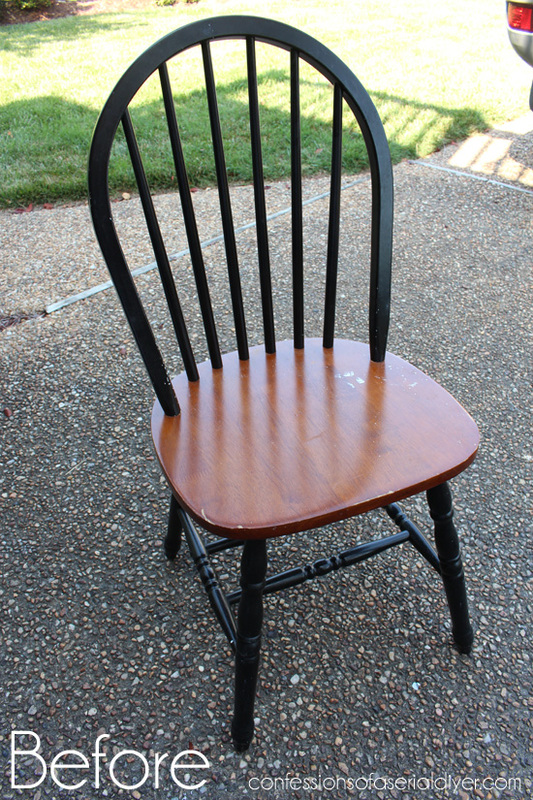 I wasn’t really interested in them, but I was already buying this antique folding table, and these chairs were so darned cheap that I decided to take them too. 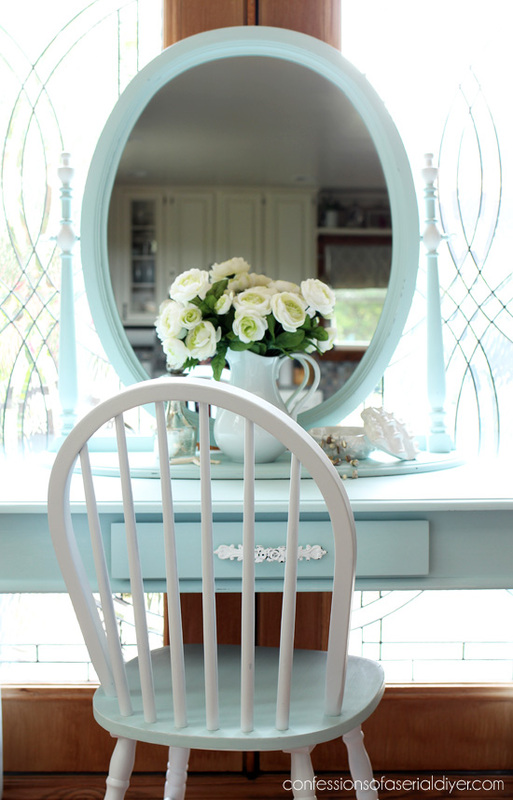 I painted just a couple of the parts on the mirror white to coordinate with the chairs. 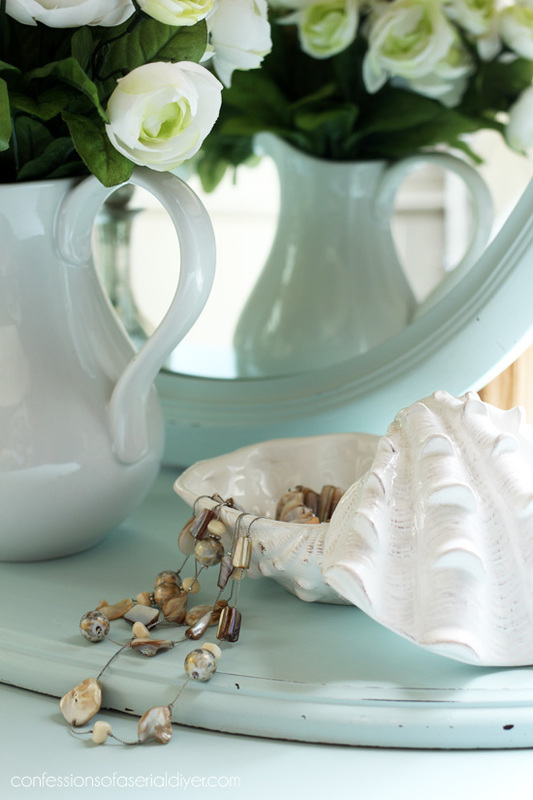 This color is Sunken Pool by Behr and I have used it a couple of times recently. It is so dreamy in person. 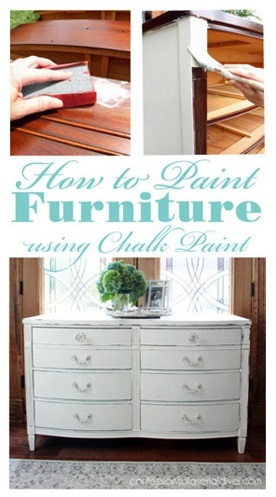 I made it into DIY chalk paint using the recipe found HERE, but I did give it all a coat of white spray primer first so that a little white would show through when I sanded. It’s a bit hard to see in the photo. 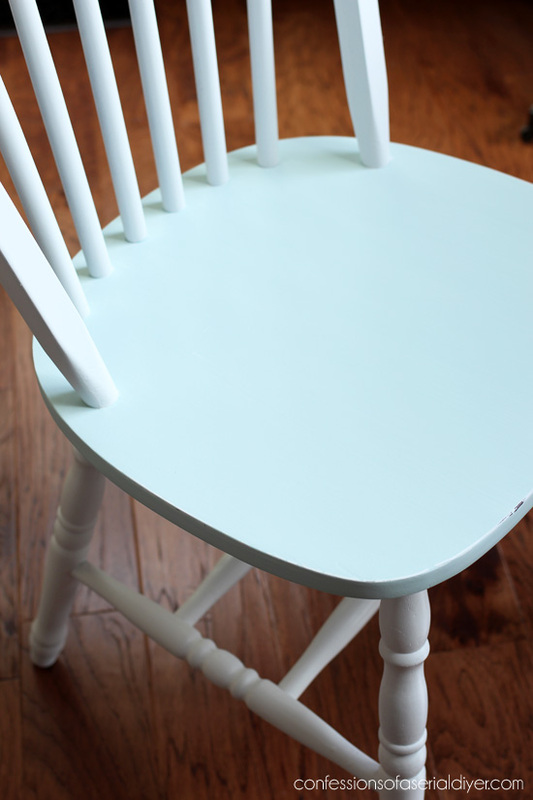 I love this two-toned look for chairs because I can spray paint all the hard parts, and then go back and paint just the seat with a brush. 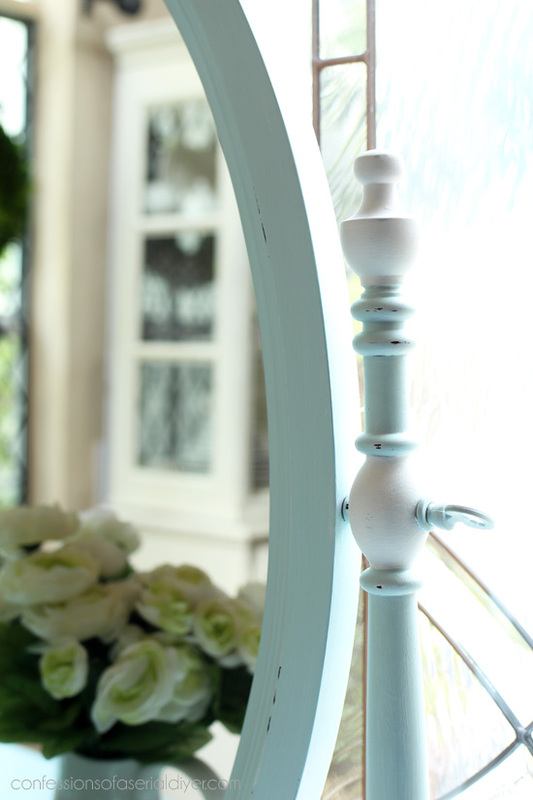 I’m not sure what I’m going to do the next time I need to shoot a large piece of furniture without my pretty doors! I love how these three totally unrelated pieces came together to make such a cute set. All three pieces, including paying Jack twice what he paid for the table, only came to $63! Funny thing…this set didn’t last ten minutes in my booth! I had rearranged my booth to accommodate it and then walked around the antique mall for about ten minutes. When I stopped by the counter on my way out to get a printout of what I had sold so far for the month, someone came up to the counter with the tag! 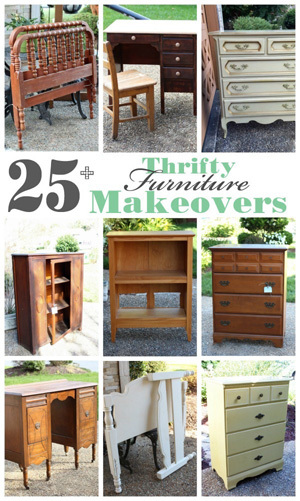 The girl who purchased it had also bought this dresser I painted for Behr.com. 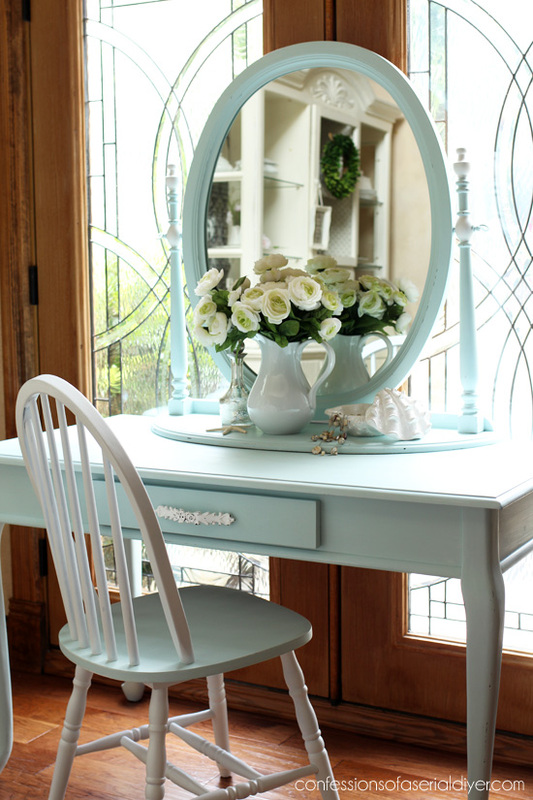 and it matches the dressing table perfectly! How cool is that? 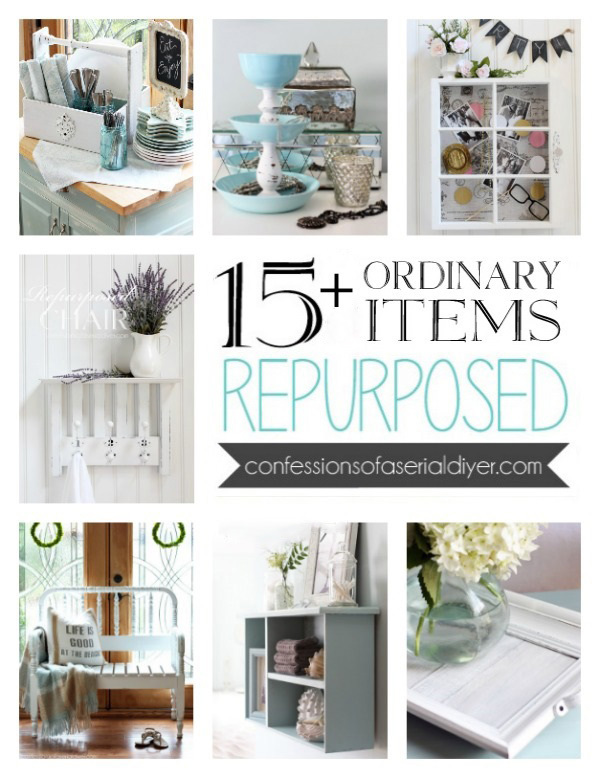 Don’t go anywhere without checking out what my friends are transforming this month too! UPDATE: Check out the HOT MESS TOUR of our new house HERE! 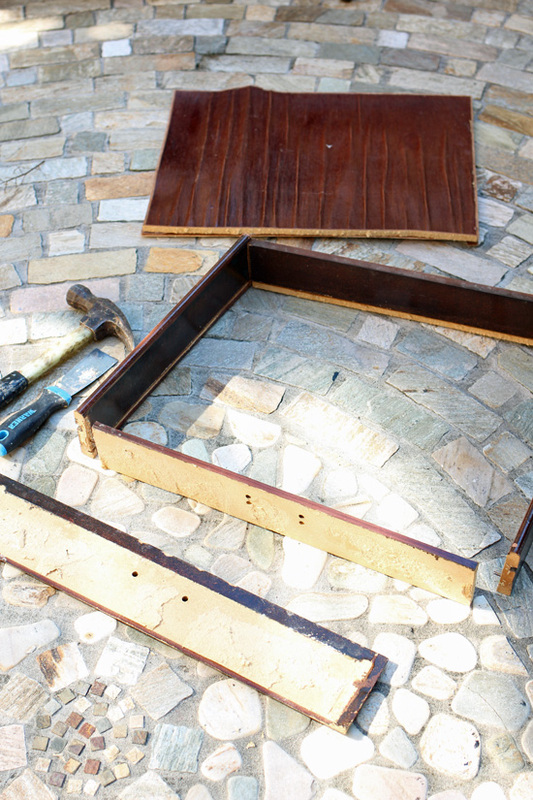 Girl, I just did the same to a table as it was worn to begin with and I tried to save it. I hear Jack on this one! So cool you not only saved it, but took it to a new level. Yay for you! No surprise it sold so fast. 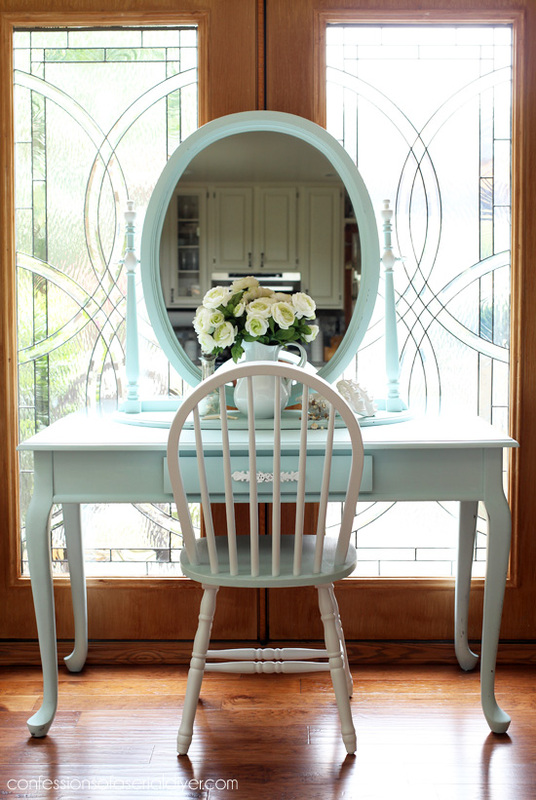 The mirror is the perfect addition to this table. Someone is going to love having this in their bedroom! The set is gorgeous. I am not surprised it flew out the door. Don’t you love that when that happens? This is another one of my favorites. Love the two-tone. You have so much on your plate right now, not sure how you found time to update these pieces. Wow, that turned out amazing. I am looking forward to seeing your new home. 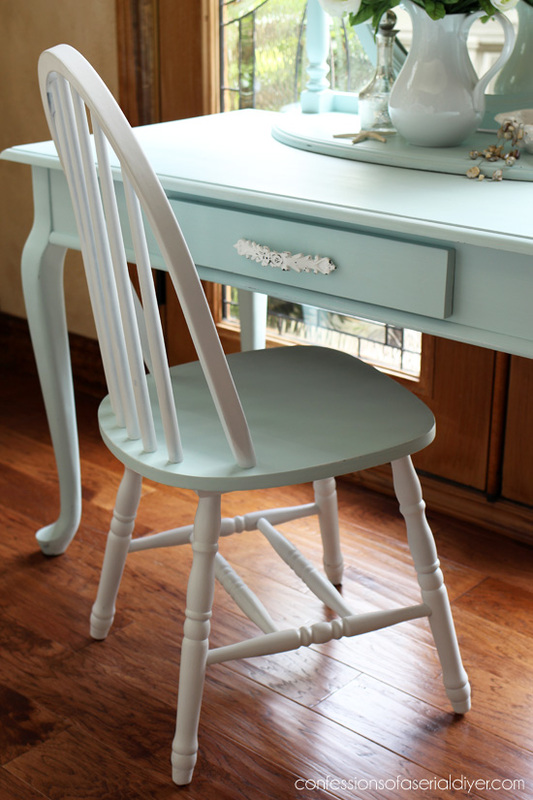 Oh, how I love that color and what a gorgeous set to have in a tween girls room. Don’t blame that lady for snatching it up so fast cause all pieces go so well together. 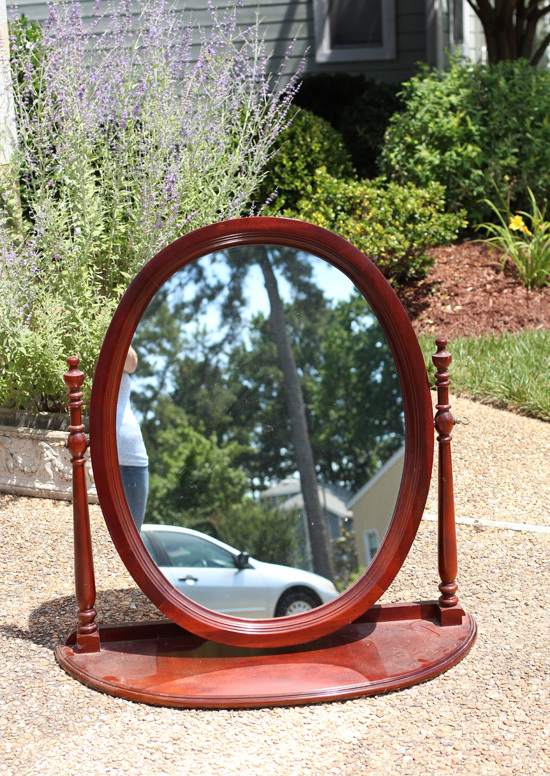 That mirror is so pretty setting on top; just like it belonged and was made for it. 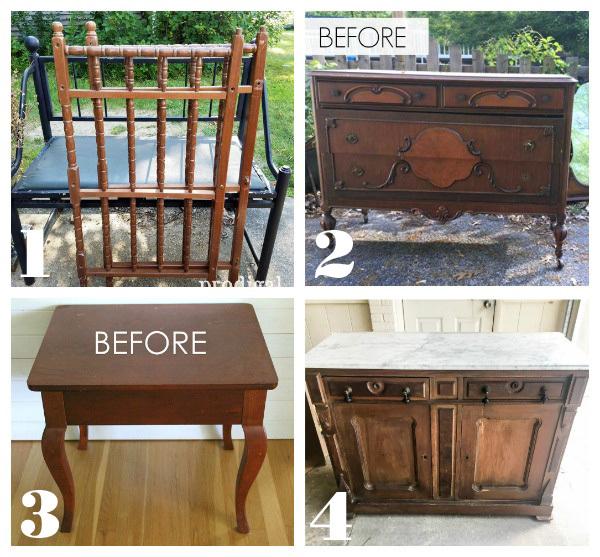 You done a great job in restoring the dresser after being rained on. 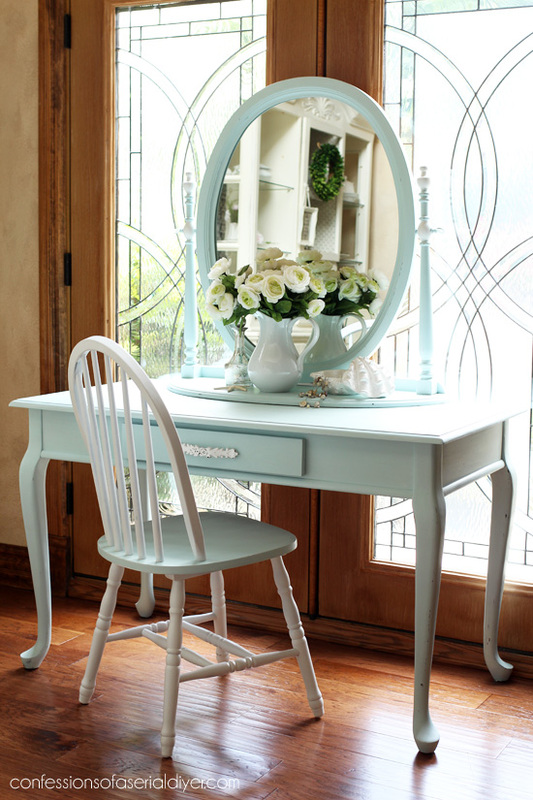 Love the desk with the mirror, and the chair. It all goes together perfectly and the color is beautiful. That piece is absolutely stunning! 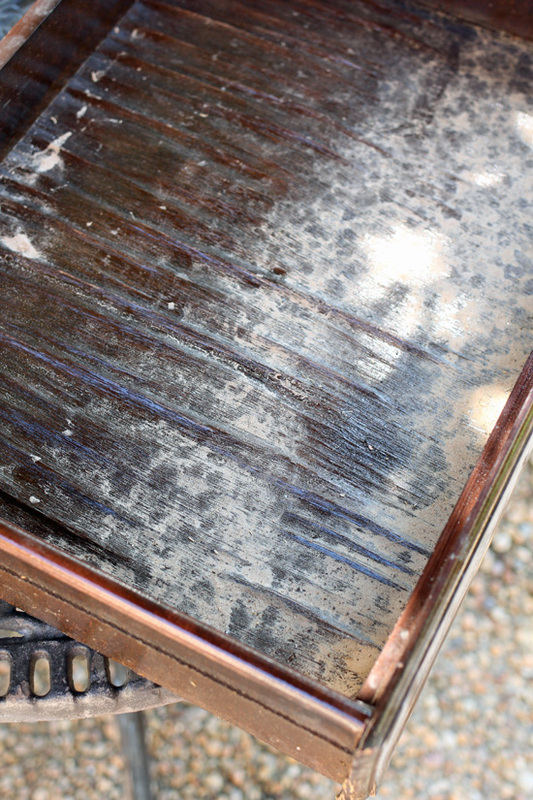 What a transformation from what it started out as, then the “weather accident” and now WOW! Just beautiful!! That turned so cute! I can see why it got snatched up! Beautiful work, Christy! I’m not surprised it sold so quickly. Not only did you get more stuff out of the garage before the move, but you created a fantastic vanity from a so-so desk. I think Jack should have paid YOU twice what he paid for the desk, since he gave up on it and you made it a treasure. Continued good wishes for settling into the new house, which will be fabulous, even with the incredible glass doors 😉. Beautiful! 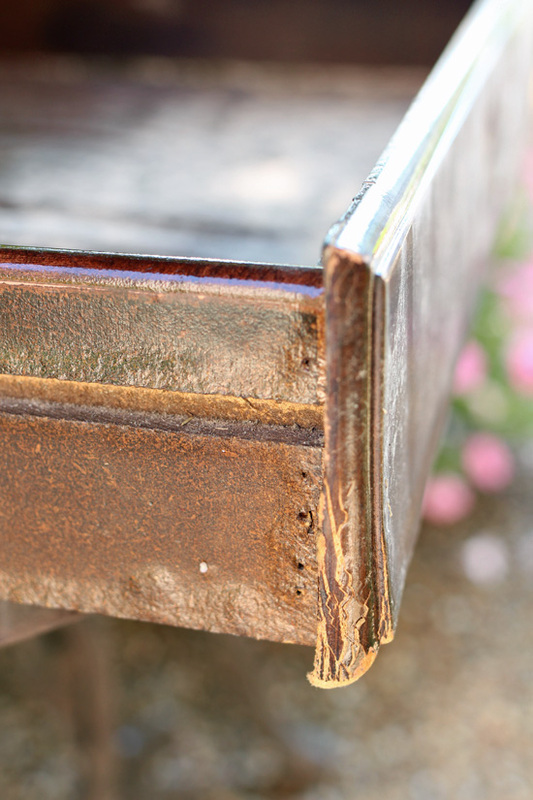 Did you wax this piece when you finished painting it? Also, what brand of white spray primer did you use? You are such as inspiration and I love all the pieces you do. 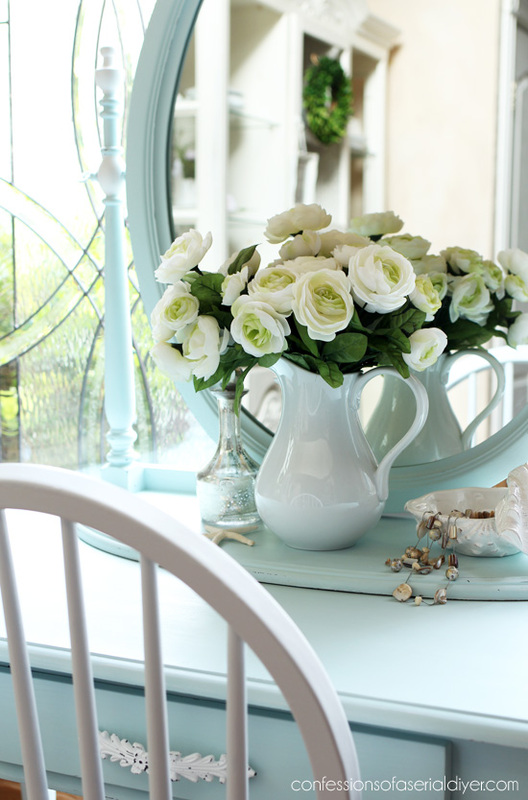 Love the dressing table – the color is great! Such a pretty piece!! I just love that colour. 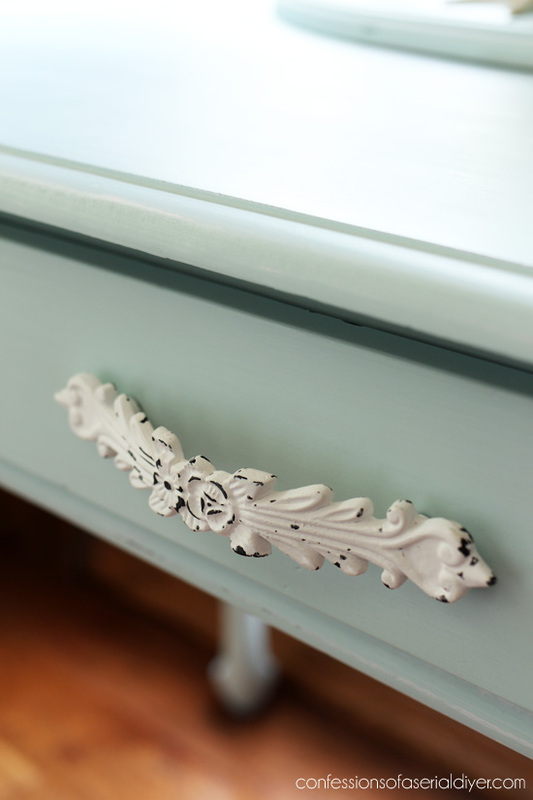 I have a night stand that I am refinishing for a friend and I think she would just adore that colour! You always do such beautiful work. Good luck with the move! 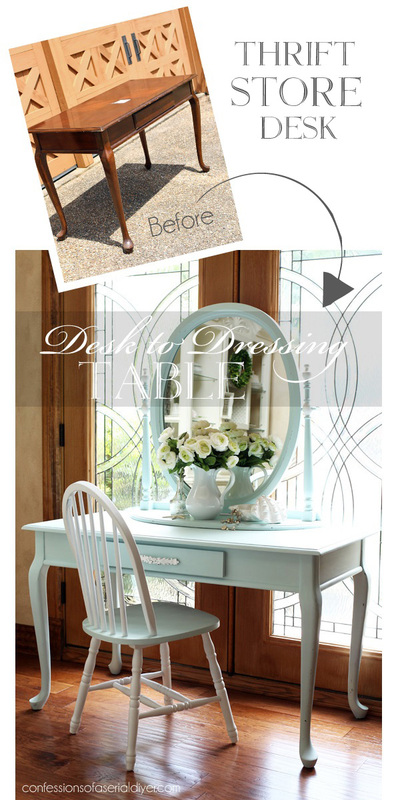 Wow this Desk to Dressing Table makeover is a WINNER WINNER, Chicken Dinner! 🙂 And it is being enjoyed in a lucky someone’s bedroom already, fantastic! I too, will miss your “background” glass doors— but look forward to your creativity every time. 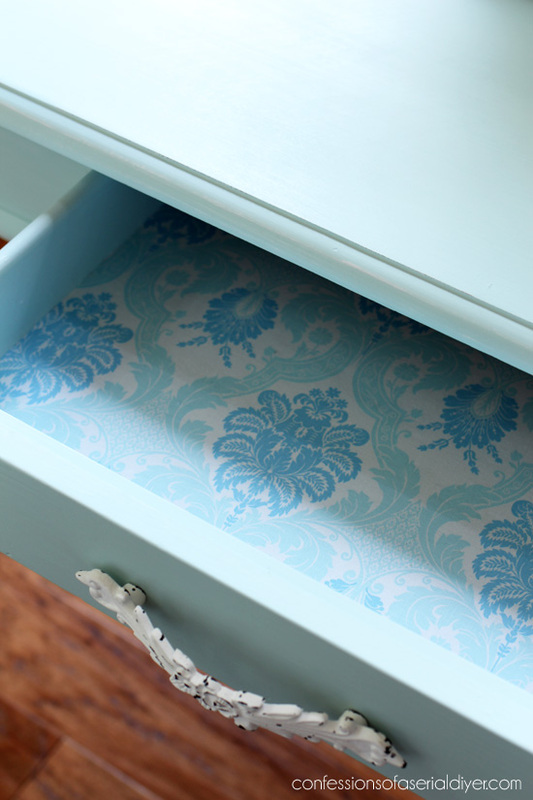 Also love the extra you added with the pretty inside drawer fabric. I know that if I was “on the fence” about buying this piece, once I looked in the drawer, that would be the surprise that would make the difference. One of these days, I will travel to your coast from San Diego and you can bet I will make a special trip to your darling booth of goodies! 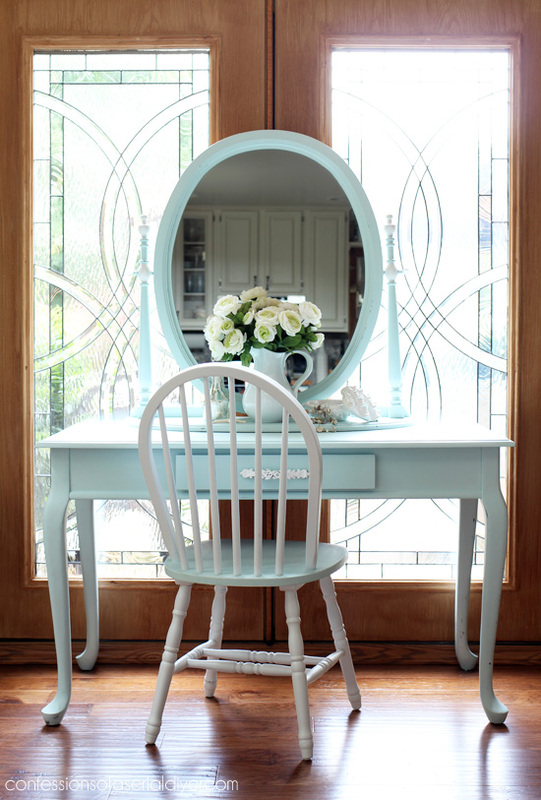 That mirror and desk and chair were meant for each other – beautiful makeover, Christy! Pinned and sharing. P.S. Sad to think that’s the last piece we’ll see photographed in front of that door. 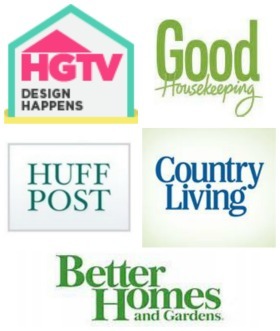 Hope you’re making great progress in getting settled in your new home. Maybe you’ll even have time to enjoy that lovely pool before Fall. Nailed it! No surprise that it sold fast. Must. Try. That. Color. 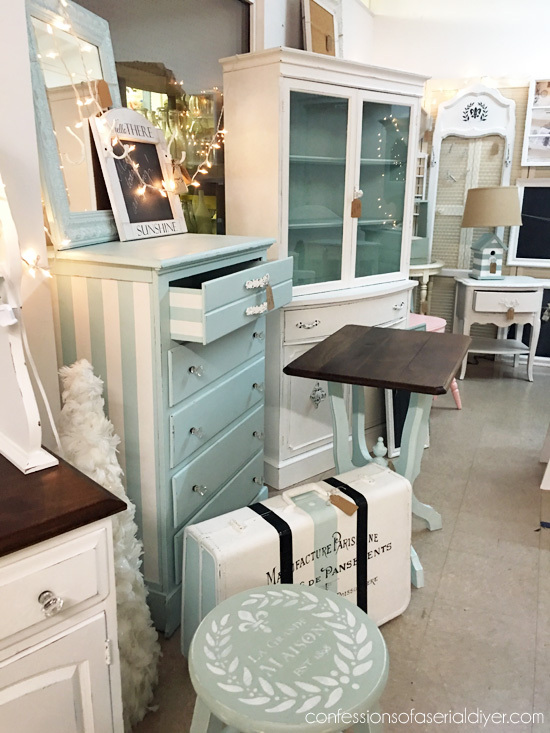 Christy, you really nailed it on the 3 piece dressing table!! All I can say is, WOW! I especially love that the white accents are not a garish white. It all blends so well. Great job! Thanks for the inspiration. 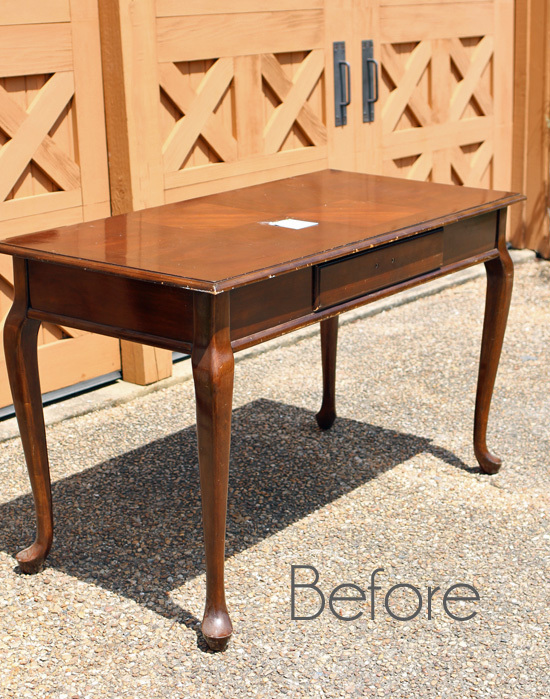 I have never commented on anyone’s DIY projects before, but this one took my breath away! It’s absolutely beautiful. I have my grandparents bedroom set that needs some love and I’d like to replicate what you did Thanks for the encouragement! This is beautiful!!! I can’t believe it sold that fast… buuuut then again I can! : ) How cool for you to be able to see that! I keep wondering what you’re going to use for your backdrops now too. Maybe you should move back… HAHA!!! No, really, I’m sure you’ll come up with something beautiful. You have that talent. This is a wonderful looking dining table. I am honestly impressed you managed to make a desk look so good!